In the summer I like dinners that are light and polite. 1) Quinoa Chicken Salad: Who wouldn’t love this protein packed chicken salad. It is perfect for making ahead and can serve a family for both lunch AND dinner! 2) Spring Caesar Salad: There is nothing like a classic caesar salad. 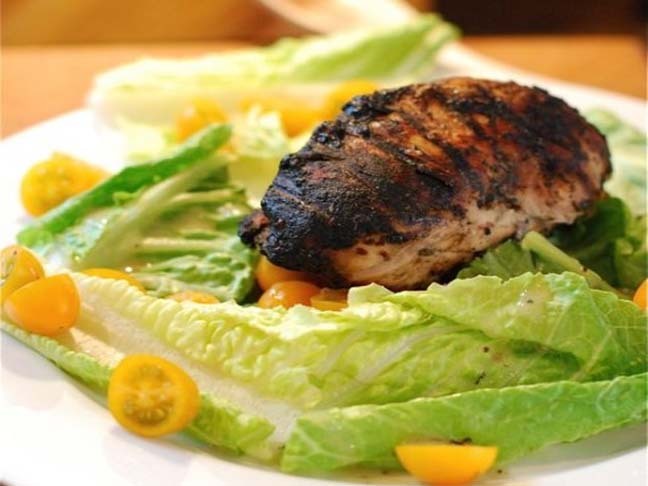 In this case I make a lightened up dressing and serve it with fresh grilled chicken. The perfect summer meal! 3) Parmesan Artichoke Burgers: Seriously, who wouldn’t simple adore these burgers. Easy to grill and packed with vegetables they are truly awesome! 4) Caprese Pasta Salad: There is nothing so delicious as a caprese pasta salad. Why not make this and serve it with some fish or chicken to make a great dinner for everyone. Or, pack it up and take it to the beach! 5) Fish Sandwich: A simple grilled fish sandwich is always a fabulous easy dinner. Light and easy, it can be made with your favorite fish!